The IC-7300 is rapidly gaining the reputation of having some of the best “out of the box” transmit audio currently available in a transceiver. After listening to several IC-7300s on the air, the reputation is well deserved. Transmit audio is excellent with the new included HM-219 electric condenser microphone. You are probably not going to improve things a lot by investing in a more expensive microphone unless you prefer a desk mike. One user was transmitting with a cheap computer headset mic through a RS-BA1 remote setup and the audio still sounded good. The audio from the IC-7300 with the default settings typically comes across as a very full warm sound. Turning on the compression still keeps the good audio but makes it more punchy to be heard over the crowd in a pileup (just don’t over do it). The large muffin fan on the back fires off when you transmit, but it is not hugely annoying. Overall the IC-7300 has excellent transmit audio for a transceiver in this price range. The built in antenna tuner is also very good. It will handle tuning up to a 3:1 mismatch very quickly and memorize that setting for future use. One interesting feature with the tuner is the Emergency Mode. Not sure why Icom decided to call it that. Anyway by activating the Emergency Mode the IC-7300’s antenna tuner can tune a 10:1 antenna mismatch at the sacrifice of output power. Output power will be reduced to a max of 50 Watts. 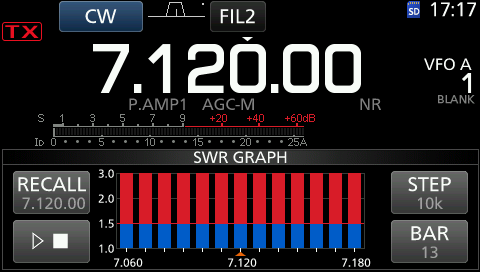 Extremely handy feature to have when you just need to try to work that 30M station on your 20M antenna. There is also a feature that can plot the SWR curve of your antenna installation to allow you to more easily adjust your antenna’s SWR. If you really miss having the ability to display the IC-7300’s spectrum / waterfall display on your PC, Icom’s RS-BA1 software will let you do that. The RS-BA1 software is really meant to allow you to control your IC-7300 from a remote computer, but it can serve as a work around for having a on screen spectrum / waterfall display on your computer. There are basically two components to the RS-BA1 software, a server program and the control program. There is no need to worry about the server program if you just want to use the control program with a IC-7300 connected directly to your computer. The spectrum / waterfall display feature will let you click and tune signals that are displayed on a direct connected computer just like software based SDR systems.. The spectrum / waterfall display can not be sized to fill the entire computers screen only lengthened vertically. Also the remote spectrum / waterfall display is slightly laggy since it’s only can be transferred at 115,000 baud from the USB port. However, it isn’t terrible and could be useful. The software can be a little fiddly to set up, but it will work as advertised. The RS-BA1 software will allow you control a large number of settings from your computer. So, in some ways you get some of the similar features of a desktop SDR application but the RS-BA1 doesn’t process any of the SDR signal it’s self. By installing the server component on the PC connected to the IC-7300, you can use the RS-BA1 control software installed on a second PC / Laptop to access the IC-7300 remotely with transmit and receive audio. A touch screen laptop or tablet coupled with a good headset / mic and Icom’s RC-28 hardware control would make a pretty nice remote setup. The IC-7300 will work well with most 3rd party digital programs. If the program doesn’t directly support the IC-7300 CAT commands, you can usually define it as a IC-7100 and get by. However, direct support is coming pretty quickly to these programs. The latest version of Ham Radio Deluxe supports the IC-7300 as well as Ominirig. Icom has certainly produced a terrific transceiver with IC-7300 and is sure to become an instant classic. It is also pretty amazing that it is being offered at it’s current price point. Especially considering the lowest priced “blackbox” 100 Watt SDRs right now is the Anan 100B at $1800 and the Flex 6300 at $2500. To be fair, both the Anan and the Flex offers more features and flexibility due to their software centric operation. However, the overall performance of these SDR transceivers are not going to be night and day over what the Icom SDR offers. Plus the IC-7300 is a complete SDR system in a box making easy for SDR novices to setup and use. There is still a learning curve to get familiar with all the IC-7300’s bells and whistles, but not a very steep one. For you that have wanted to get involved with SDR technology but didn’t care for the potential complications with a computer driven system, then the IC-7300 is for you. So far the early adopters of the IC-7300 who have commented in forums, user reviews, and on Facebook have been extremely positive. This often isn’t the case with new radio launches especially on forums where users can be very vocal with their criticism of a product, there have been a few minor issues reported , but nothing significant so far. If you are interested in doing some reading for what current owners think, check out the Yahoo IC-7300 Group or the Facebook IC-7300 Group. The only area that Icom slightly dropped the ball, was on not providing the IQ audio via the USB port (to be fair, not all users aren’t going to care about this). This would allowed the IC-7300 to be used with 3rd party SDR software providing more flexibility and generating interest amongst traditional SDR users who would like to have that optional feature available. If technically possible, maybe Icom will add that feature in a future firmware upgrade. For sure the IC-7300 has certainly shaken up the overly stagnant HF transceiver market that has been in place for the last 15 years or so. It will be interesting to see how the “black box” manufactures and companies such a Yaesu and Kenwood will respond now that the gauntlet has be thrown down. This should be fun. Thanks Icom! *Photos of the IC-7300 screen were captured with the built in screen shot function.